American Secretary of State Mike Pompeo, speaking at a news conference with the Georgian Prime Minister Giorgi Kvirikashvili, at the State Department in Washington, unequivocally condemned and called for the withdrawal of Russian troops in the occupied, breakaway territories of Abkhazia and South Ossetia. Georgia fought a war with Russia in 2008 over the efforts of the areas to break away from the Georgian republic. Russia invaded militarily and remains to this day. 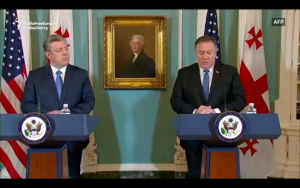 Pompeo called on Russia “to withdraw its forces” from Georgia’s breakaway regions of Abkhazia and South Ossetia and “provide free access for humanitarian assistance to each of those two regions,” reported RFERL.